This is my guide to finding and assessing the best Football Manager 2018 free agents. It applies to top leagues by default, which means that the players you see below will likely have no interest in joining a lower league side. I will work on another list for lower leagues when time allows, so keep checking the site for that in the coming weeks. 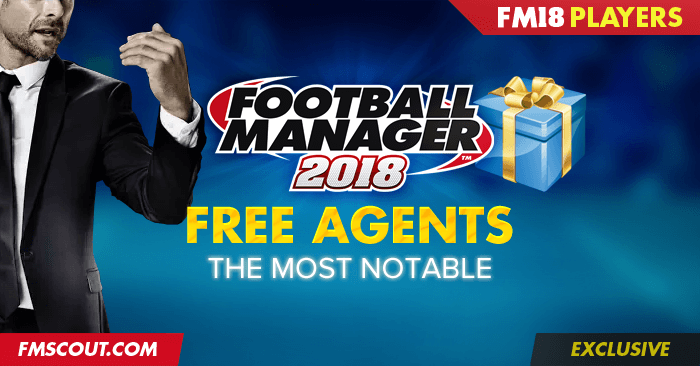 This list includes some of the most notable free agents in Football Manager 2018 who would be willing to join a team from the top divisions; mainly top flight sides or second division ones in certain nations, such as English Championship. So essentially these are the best FM 2018 players available on a free transfer at the beginning of the first season (July 1st, 2017). Top 365 FM18 free agents are included. This is the successor of my ultimate list of Football Manager 2017 best free agents. I will be revising this list often as I gather more data from my test saves and of course based on your feedback in the comments down below. They are players without contract available on a free transfer. Free players are ideal to boost your squad when your transfer budget is very limited. They are usually players in the twilight of their career, but there are always cases of younger players who are still free for different reasons. What does the rating (R) mean? It's a personal recommendation system for your convenience. I'm using a 1-100 scale based on English divisions. I loaded all players (340k+) in-game to produce this list of FM18 free players. Your savegame probably has less players loaded.